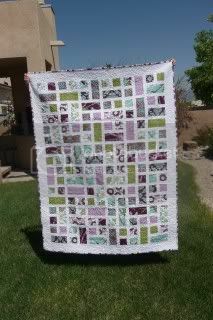 I made my mom a quilt for Mother's Day. 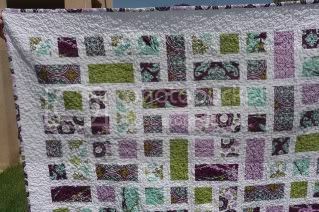 Actually, I made my mom two quilts, but the first one was really ugly, so I started over. This is the good one. I got the idea from Film in the Fridge. It's the Rectangle Squared block pattern. 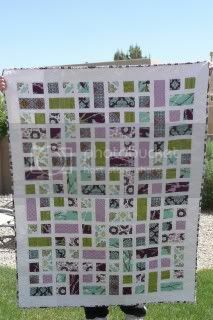 I used Joel Dewberry's Aviary 2 fabrics - one pack of fat quarters. I believe there were eight of them. I sashed it with white. 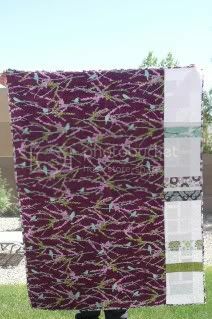 I used one of the Aviary fabrics, the purple one with the birds, for the backing. I didn't have quite enough, so I pieced it with scraps. 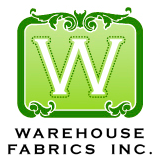 I like the effect better than an all-one-fabric backing anyway. And, finally, I stippled it. I love the texture of stippling, so I almost always use that form of quilting on my projects. 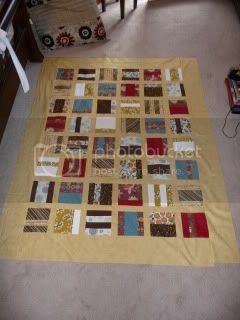 Here's the quilt top I originally made. The pattern was Oh, Fransson's Mixtape pattern (although this link is to an updated version of the pattern), and I was so proud that I selected a dozen fabrics to go together. Only, they didn't. And my sashing choice was just awful, it turns out. Oh, and I made tons of cutting and sewing mistakes, so it was quite wonky. LOVE the purple!!! I was just thinking today that I need more purple in my life, that if I decide to ever attempt a quilt that I want to make a purple one.